On the April 19, 1993 Waco FLIR (forward-looking infrared) video, two dark (cool) objects appear on the ground from under a tank as the tank rolls forward. Seconds later bright (warm) flashes occur on one of the two objects and then on a third dark object that appears only after the FLIR-mounted aircraft moves forward. Some infrared analysts believe the dark objects are gunmen and the flashes are gunfire. However, careful analysis reveals that (a) the flashes occur on the objects, not forward of them where gunshots would be, (b) the objects proposed to be gunmen never move, not even to avoid the tank's tread, and (c) the flashes differ significantly from known gunshots on FLIR. The first graphic illustrates the gunmen-interpretation of the objects at Location 2 presented on the documentary Waco: A New Revelation. The claim is that in a classic "infantry maneuver" the gunmen had just exited from the tank's underside escape hatch during one of many penetrations into Mt Carmel. Exiting between the tank's treads the gunmen would not be crushed. The second image in the following graphic shows where thermal flashes of gunshots would appear -- at the end of the gun forward of the prone gunmen. Image from Waco: A New Revelation depicting gunmen allegedly at Location 2. Second image shows where gunshots would appear. The next graphic is a two-frame animation showing the dark objects on the FLIR said to be gunmen and two flashes on them said to be gunfire. Hint: the large white (hot) area in frames A and B is the heat of the tank's exhaust. Observe that the flashes said to be gunshots occur on two of the dark objects, not forward of them as we just observed would be the case if the objects were gunmen. Frames A & B from Waco: A New Revelation. C and D from full FLIR video. While there are three objects, only two are dark and thus visibile in frame A. The third makes its presence known in frame B by a reflective flash on it. As the aircraft rotates about 70 degrees to frame C, the third object upon which that flash occurred gradually appears. Observe that, apart from the rotation, the configuration of the objects in frames A, B, and C is the same. In frame D, two minutes later, a fourth dark object is seen next to the other three. While the dark objects fade in and out of visibility as the aircraft moves, they never move during the period from their first appearance to the end of the FLIR tape. Because the dark objects remain motionless on the open ground, they resemble inanimate objects more than gunmen in the middle of a gunfight, as several analysts claim. Furthermore, because the flashes occur on the objects, not forward of them, the flashes resemble reflections on those objects, not gunshots. The flashes on the objects are probably thermal reflections of the tank's white-hot exhaust, which is about ten feet forward of the objects when the flashes appear on them. The only puzzle is why the dark objects fade in and out of visibility. My hypothesis: the objects are reflecting the cool and thus black sky, and the aircraft is in postition to see the reflected sky only sometimes. As an infrared imaging primer states: "Highly reflective materials reflect the temperatures of the objects around them. A good example is ... chrome bumpers [which] appear much colder [and thus darker] than the surrounding painted metal. This 'apparent' temperature is a reflection of the cold night sky." The Vector Data test FLIR sometimes pointed at the sky and in so doing confirmed that the sky appears black (cool) to the FLIR even on a warm day. It's therefore possible that the flashes on the objects and the transient coolness (darkness) of the objects are both results of the objects being highly reflective of temperatures in their environment. On several occations the dark objects are run over by the tank's treads. If they were gunmen they should move to avoid certain death, and since the tank moved slowly, they had every opportunity. Yet the objects just sit there as the tank slowly runs over them. In the following images one of the Location-2 objects is visbile as the tank backs out of the building. The bright area is the tank's hot exhaust. Notice that the object is to the left of the center of the tank and is lined-up with the tank's left tread as the tank rolls toward and eventually runs over the object that does not seem like a person. Last but not least, all Location-2 flashes differ significantly from known gunshot flashes on FLIR. The first graph below shows the duration and intensity of brightness of the flashes that occur on one Location-2 object during the series of all video frames in which those flashes appear. Intensity of flashes at Location 2 during 50 video frames (30 frames = 1 second). The levels of intensity are: 4 (very bright), 3 (bright), 2 (dim), and 1 (very dim). The next graph shows the intensity and duration of flashes on the second of the two objects upon which flashes occur at Location 2. Note the extreme difference between the structure and durations of real gunshots on FLIR and the Location-2 flashes, one of which is 30 times longer than the known gunshots! This difference is why the Maryland Advanced Development Laboratory failed to identify a single gunshot on the Waco FLIR after they ran it through the Viper FLIR gunshot detection program. The cyclic rate of Location-2 flashes is reasonably attributed to the constant gale-force winds that day rippling the surface of the objects. 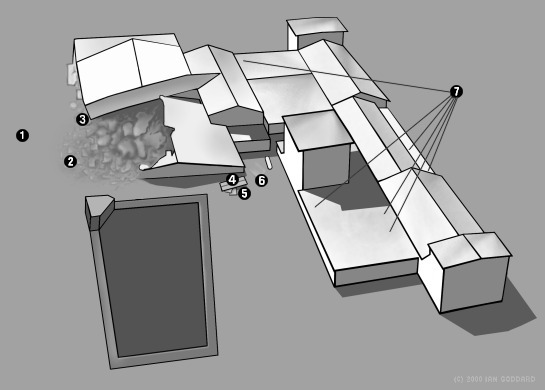 Examination of the FLIR and visible-light photos suggests that the objects may be a sheet-like material that is widely strewn around the demolished gym and appears dark on the FLIR in the many locations it can be seen, such as this large triangular shaped object seen on both FLIR and visible-light photos, which is a large crumpled-up sheet material that was probably a thermal and/or vapor barrier inside the smashed-apart walls. Virtually everyone who sees the sequence of flashes at Location 2 shown on the two popular Waco documentaries believes what they are simultaneously told, that the dark objects are gunmen that exited from the underside of a tank and the flashes are those gunmen shooting at Mount Carmel. This is because it really does look like that when viewed in the limited context shown. However, everyone I know who has viewed the uninterrupted FLIR beyond the brief segment shown in the documentaries is at a loss to explain why the "gunmen" just sit there, even as the tank slowly rolls over them, or why at least four dark motionless objects at and around Location 2 fade in and out of visibility over time. The alleged gunmen also never "fire" any more "gunshots" after the flashes examined above... they just sit there the whole time like inanimate objects. Conclusion: for the many reasons detailed herein, I see no reason to believe that the objects at Location 2 are gunmen or that the flashes on them are gunshots. On the other hand, I see every reason to believe that the flashes on the objects are reflections on the objects of the tank's hot (white) exhaust a few feet forward of them, which was the conclusion of the Vector Data report (see event 8). The Location-2 ojects may be pieces of the sheet insulation-type material strewn around the smashed gym. The slow on-off rate of the Location-2 flashes may be the result of the gale-force winds on April 19, 1993 rippling the surface of a reflective material, as was the case with a reflective material flapping in the wind at Location 6. * The machinegun-flash graph above is based on (1) examples of the intensity and duration of single gunshots on FLIR seen in (a) a clip of a FLIR video taken during the U.S. raid on Somalia seen on Waco: A New Revelation and (b) the Vector Data Test FLIR, the intensity and duration of which were then superimposed onto (2) the cyclic rate of a firing M-16 shown close-up on Waco: A New Revelation (each ejection of a bullet cartridge from that M-16 represents one firing cycle, and as the graph above shows, the cyclic rate varied between 4 and 5 video frames per firing cycle). The cited examples of gunshots on FLIR show that muzzle-flash duration is not more than the duration of one video frame (1/30 second), and the Vector Data Report measured gunshot flashes to be as fast as 1/50 second and never faster than one frame. In the few examples of real gunshots I've seen on FLIR, a flash instantly appears at full brightness and then is instantly gone in the next frame with a total duration of one frame. Note: the first flashes highlighted in the Somalia chip cited above appear to be flying debris blown around by the helicopter-blade wash, but the highlighted flashes toward the bottom of the screen and the one flash that's magnified as the prime example are consistent with gunshot signatures seen on the Vector Data FLIR-test video.